Cinematic Autopsy: EVIL LURKS UNDER THE WATER IN "THE BLACK WATERS OF ECHO'S POND"! 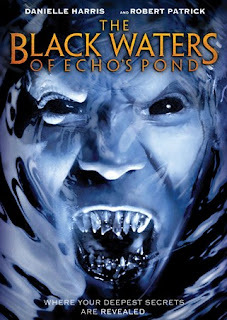 EVIL LURKS UNDER THE WATER IN "THE BLACK WATERS OF ECHO'S POND"! SCREAM QUEEN DANIELLE HARRIS AND ROBERT PATRICK STAR IN THE UPCOMING FILM "THE BLACK WATERS OF ECHO'S POND" WHICH HITS DVD & BLU-RAY SEPTEMBER 10TH! MY REVIEW WILL BE COMING SOON SO LOOK OUT FOR IT! In 1927, archaeologists unearthed a major historical find in Turkey. What happened next is the stuff of legend...and nightmares! In the film, nine friends take a holiday at a Victorian home on a private island off the coast of Maine. There, they uncover a game first discovered as part of an archaeological expedition from over 80 years ago that resulted in a series of mysterious – and grisly – deaths. What they don’t realize is that when played, the ancient artifact brings out the worst in each of them. Jealousy, greed, hatred, lust, all of the things they keep buried deep inside themselves rise to the surface and come to a boil. A warning to all those who start the game: it just might finish you!